I read about a woman in the US who died after hitting another vehicle head-on while posting on Facebook. Whenever I read something like this it makes my blood boil. Luckily, of all the vehicles this callous woman could have hit, it was a large truck, the driver of which wasn’t hurt. However, as she crossed that centre line, distracted because she *had* to post how much she loved a song (?!?!?!?! ), think about how easily it could have been any of our friends/family on a motorbike that she hit. When are people in the states (and Canada) going to lobby to outlaw (or enforce, where this is already outlawed) the absolute stupidity and selfishness of drivers using their phones/gadgets while driving?? This is not an infringement on people’s liberties, this is just common sense! The real victims in this case are this selfish woman’s friends/family for the grief they are now going through—and the driver of the truck who will have her needless death on his mind for the rest of his life. Laws have existed for several years in Europe and elsewhere about this and people are regularly fined, or, if causing bodily harm, imprisoned and banned from driving (for life in some cases) but even here you often see people fiddling with their phones/gadgets. Please share this with everyone you know. When you’re driving/riding, focus exclusively on driving/riding. You could save someone else’s life—or you own. 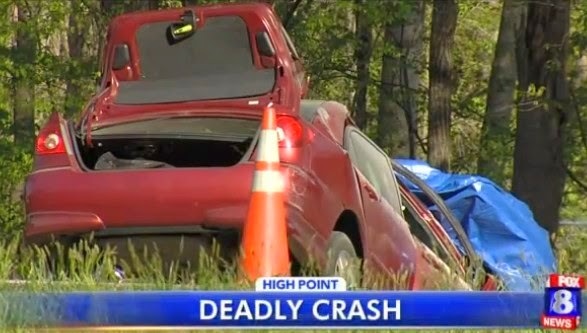 A woman is dead after slamming her car head-on into a truck while posting selfies and a Facebook update about how happy she was while listening to a song. [name/location removed], crossed the center median of a busy road Thursday morning just after making the post, hit a recycling truck and died, police said. Further inspection of her phone revealed pictures posted online only minutes earlier. Authorities said the post, visible only to her friends, was made at 8:33am, the first 911 call received about the crash was one minute later. ‘In a matter of seconds, a life was over just so she could notify some friends that she was happy,’ a police spokesperson said. Footage from the scene showed [name removed]’s car had careened off the road into a ditch near some trees. The recycling truck was only feet away, also in the grass. [Name removed]’s car caught on fire after running off the road. The truck hit a tree. Authorities believe she was traveling at about 45 mph at the time of the accident. Alcohol and drugs have been ruled out as a cause, but police are still running a toxicology report to confirm, sources said. She died instantly, cops said. The truck driver was unharmed. Investigators also discovered a series of selfies posted by the woman while she was driving, police said. ‘As sad as it is, it is a grim reminder for everyone… you just have to pay attention while you are in the car,’ the spokesperson added. [Name removed] was wearing a seat belt, police said, but it fastened improperly. It is not clear if wearing the restraint correctly would have saved her life.